With Easter at the end of the school holidays it gives a bit more time to do some Easter themed activities at home. Here are some of the activities I am doing with my boys. I regularly use Attention Autism at home, its such a great activity. For our Easter attention bucket I have found most of the contents from the local pound shop. Anything bunny, chick or sheep related is a winner. Wind up toys and flashing wands are usually in the supermarkets at this time of year. I hid some chicks in the plastic eggs and used some craft feathers and dropped them from a height so we could watch them float down. For the attention builder I have gone more spring focused than Easter but we have had lots of rain and sun so rainbows have been in abundance. A very easy one, put lines of paint on a sponge in rainbow order. You can make this look better with all the colours and new paint but the effect works just as well with just red, yellow and blue if that’s all you have. Then run the sponge over the paper to form your rainbow. My eldest thought this was amazing when I let him take a turn. My non-verbal 5 year old really needs visual aids and they make such a difference to his understanding. If we are having a big family gathering I always show pictures of everyone coming before hand so my son has time to process the information. 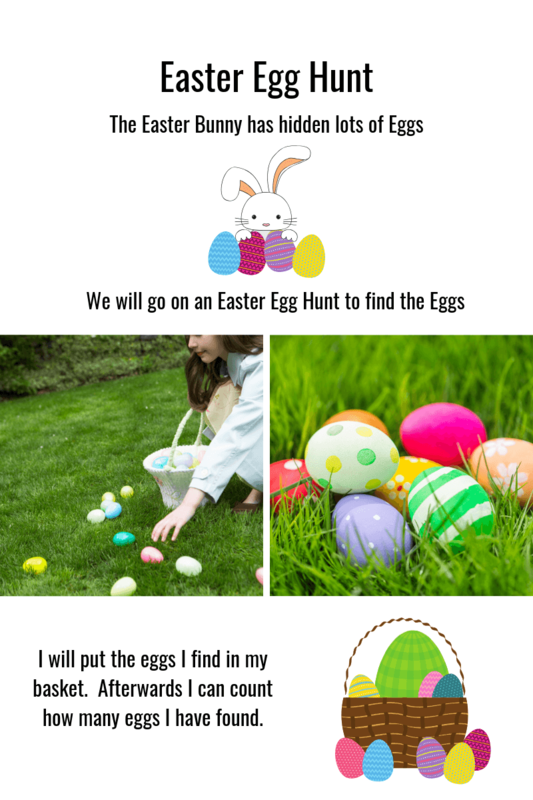 Here is a simple visual you can use to support an Easter Egg Hunt. You can always write a social story to explain what will happen at Easter in your household. My eldest using the Picture Exchange Communication System to communicate. At this time of year most local farms will have baby animals which can be a great opportunity to use PECS to talk about what you can see or have seen. It is also a good time to introduce seasonal vocabulary. I find commenting with PECS the best way to do this. Our Peppa Pig Easter book is perfect for commenting about Easter. Our favourite Easter book is Peppa Pigs Easter Egg Hunt, using a familiar character the book is much loved in our house. Another great one particularly for using with PECS is Spot’s First Easter. A similar story to Peppa’s Easter Egg hunt is Peppa Pig Easter Egg but the book is shaped like and Egg so makes a nice gift. A fun rabbit themed book is Julia Donaldson and Lydia Monks book the Rhyming Rabbit. Last year we had this lovely sticker book which was a great Easter based activity and a really lovely gift too. I have no idea when Easter Tree’s became a thing but I love it. I got some cheap decorative branches from the supermarket and let the boys lose with Easter chicks and some hanging decorations also picked up from the supermarket. Its a really simple decoration and looks great. There are so many craft options at the pound shop like Easter bonnets to decorate, the kids love sticking things onto the hats (and then pulling it all off again!). Easter cards are a nice way to have something your child has made that you can give to relatives. The Chick below is very easy. Easter is a great time to do some baking, either before or afterwards to use up all the chocolate. Little Easter nests can be very easily made with Cornflakes, we also made some cupcake sheep using lots of marshmallows. We also attempted some marshmallow rabbits but I think they ended up more like mice in the end! I hope this post has given you a little inspiration for some Easter themed activities. Don’t forget to sign up for my monthly newsletter to get more seasonal themed activities for autistic children throughout the year. This post contains affiliate links. If you purchase from an affiliate link I may receive a small commission. This is at no additional cost to you and helps to support my blog. Thanks, my son really enjoyed putting all the marshmallows on the sheep. My 6 year old son loves Easter egg hunts. Those little baking ideas look brilliant. I’ll give them a whirl.